HOV lanes stretch 11.5 miles in both directions of the Pomona Freeway (SR-60) between the Orange Freeway (SR-57) and the San Gabriel River Freeway (I-605). Photo by Juan Ocampo. The westbound carpool lane along the Pomona Freeway that runs 11.5 miles between the I-605 and the Orange Freeway (SR-57) opened to traffic this morning, completing a $122.6-million HOV lane project. The 11.5-mile eastbound carpool lane opened Sept. 27. Construction involved the widening of several on- and off-ramps and construction of soundwalls at various locations. Caltrans District Director 7 Michael Miles and Los Angeles County Supervisor Don Knabe wrap the completion of the HOV Lane Project. Photo by Juan Ocampo. 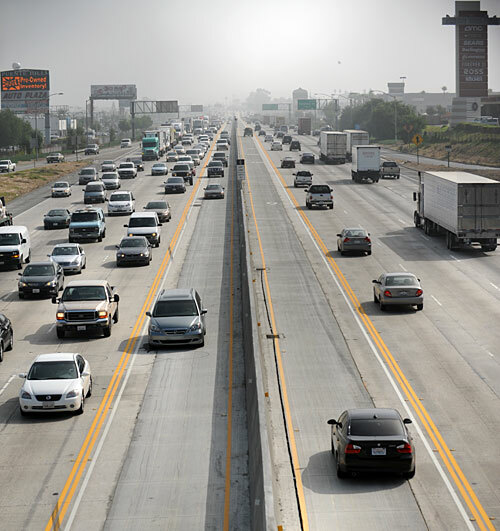 A Caltrans fact sheet pointed out that the Pomona Freeway is used by a quarter million vehicles daily. The freeway, which is also a major truck route to and from the ports of Los Angeles and Long Beach, is a busy corridor that links the major business districts of downtown Los Angeles, the San Gabriel Valley and Riverside and San Bernardino Counties. “Metro remains committed to funding a variety of transportation alternatives that get solo drivers out of their cars and into public transportation or a carpool and vanpool,” said Metro Board Chair Don Knabe. $122.6 Million dollars simply to repair a carpool lane? Why not use those funds to put more buses on the road? $123 million for 11.5 miles of carpool lane and on/off ramp improvement is actually really cheap! We are spending $1 billion to get a couple of miles carpool lane on the 405. Now that is a giant waste of money that could have gone to accelerating the 405 corridor rail line project.